Over the years the gradual action of the weather, the sap, leaves, seeds and berries which fall from overhanging trees and the accumulation of mosses and lichen all have an effect on the condition of the memorials to the loved ones in your family. Renovation will reveal once more the beauty of the original memorial. Whether it's a regilding of the older gold-leaf lettering, a much-needed re-blacking, the replacement of lost lead letters, or just a thorough clean which is needed, we'll be happy to undertake the work. 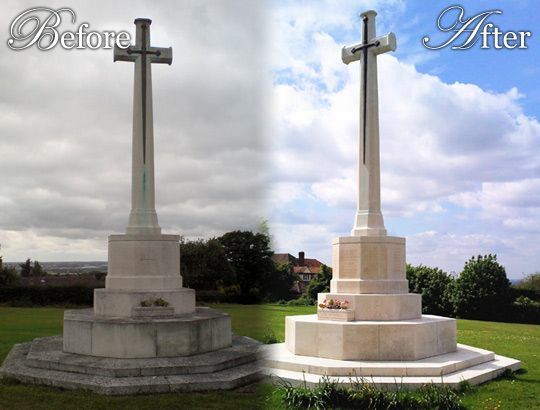 The renovation of a memorial may not cost as much as you might imagine. Phone us today for a no obligation quote.